This Pear and Pomegranate Crumble is the perfect dessert for a special occasion or holiday feast. Pomegranate juice adds a festive twist to this comforting dessert favourite. If you ask me, I think this Pear and Pomegranate Crumble would be the perfect ending to a luscious holiday lunch or dinner. The tasty and lightly spiced fruit filling of this festive Pear and Pomegranate Crumble melts in your mouth, while the crumble topping is perfectly crunchy. Your guests will love this special, yet comforting holiday dessert! This Pear and Pomegranate Crumble is very easy to make, and given that time is crucial when you prepare your holiday meal, this is a big bonus. Initially, I wanted to make a this crumble recipe with cranberries, but guess what, they are nowhere to be found here in Sydney. Fresh, frozen, dried… There’s no way you’ll find cranberries. Maybe I didn’t look at the right places, who knows? But anyways, I had to change my dessert plans. 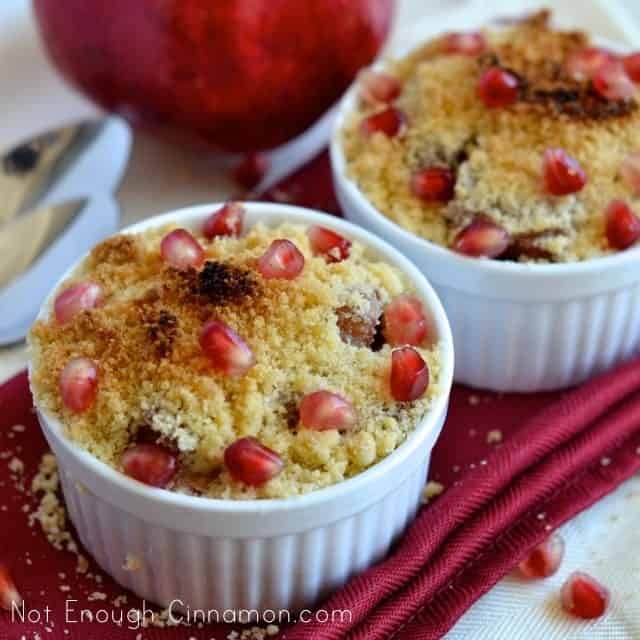 And I’m glad I did because this Pomegranate Pear Crumble is really good as it is! 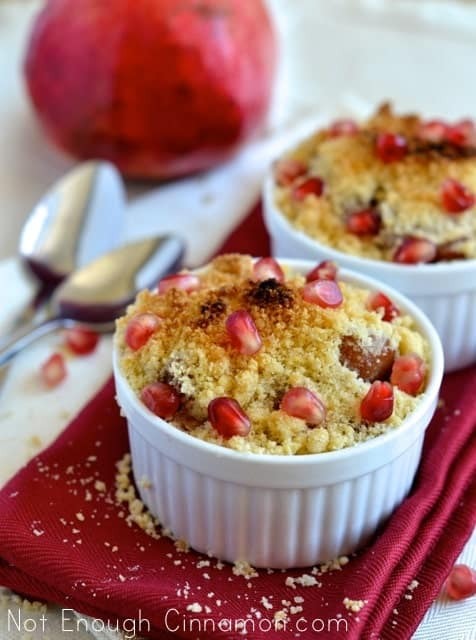 The first time I tried this Pomegranate Pear Crumble, I used pomegranate arils and juice for the crumble filling. Solal and I both agreed that the taste was nice but the crunch of the pomegranate seeds was really unpleasant. So, when I made this crumble for the second time, I left out the arils and just kept the pomegranate juice. 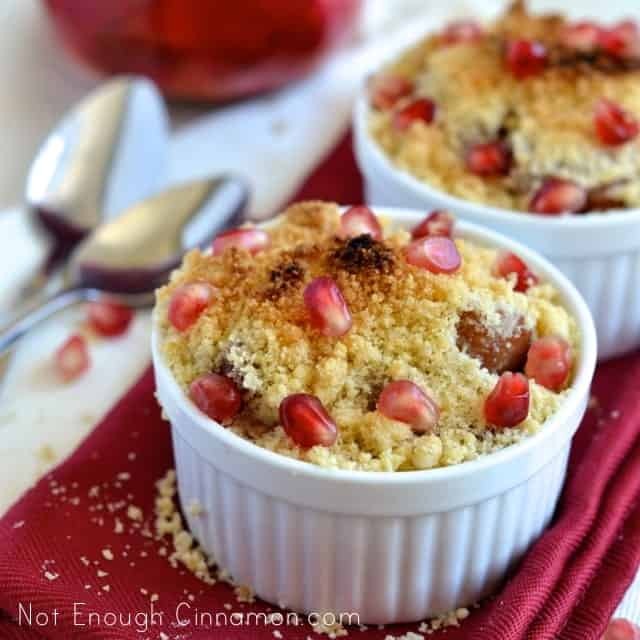 If you like their “crunchiness”, add the seeds of half a pomegranate with the pear mixture. Your choice! 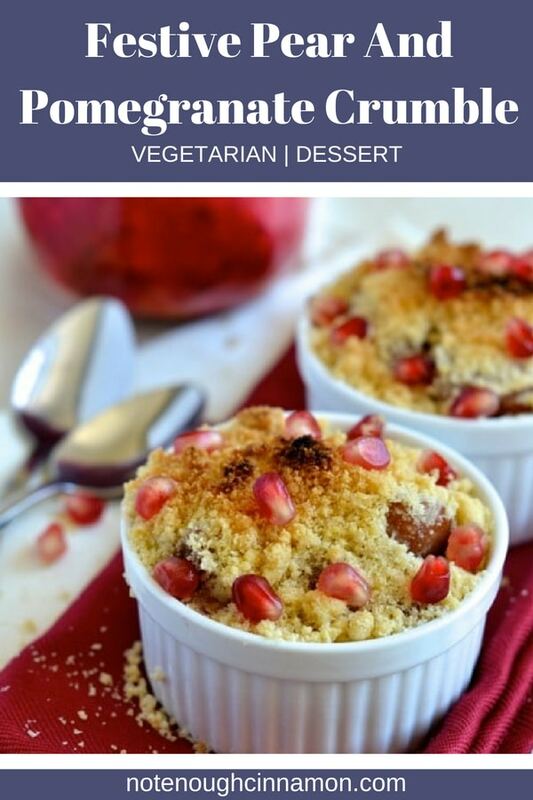 If you tried this recipe for Pear and Pomegranate Crumble, don’t forget to rate the recipe below and let me know how it went in the comments – I love hearing from you! You can also follow me on Instagram, Pinterest and Facebook for more deliciousness and behind-the-scenes! This Pear and Pomegranate Crumble is the perfect dessert for a special occasion or holiday feast. Pomegranate juice and pomegranate seeds add a festive twist to this comforting dessert favourite. Serve it fresh out of the oven with vanilla ice cream. In a large bowl, mix together pears, cornstarch, clove, cinnamon, honey and pomegranate juice. Transfer this fruit mixture into a large non-stick skillet and cook on medium-high heat until juice has thickened, about 10-15 minutes, stirring regularly. Meanwhile, prepare the crumble topping. In a medium bowl, add flour and rub the butter into it until it resembles breadcrumbs. Stir in sugar and mix well. Divide pear mixture into 8 ramequins or a baking dish. Generously top with crumble topping and bake for 30 minutes if using ramequins, and 45 if using a baking dish, or until the crumble topping is golden brown. 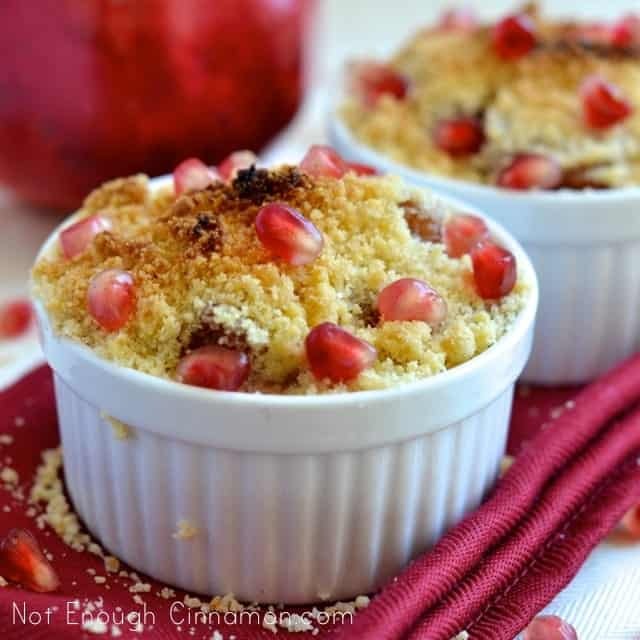 Sprinkle the baked crumble with pomegranate arils and serve warm with vanilla ice cream. wow i’ve only tried making apple crumble really need to try this one too!!! I can really picture this crumble as the highlight of my Christmas dinner, served with a big scoop of ice cream and maybe a mug of mulled wine! YUM!